A majority of these new residents are favoring apartments as rising home prices push the concept of ownership out of reach for many. The homeownership rate fell from a high of 71 percent in 2006 to just over 50 percent during third quarter 2017. 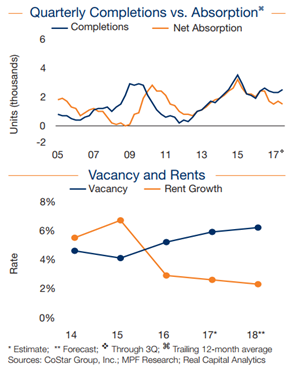 Healthy demographic trends and a shift in residents’ attitude away from homeownership keep investors optimistic about the Austin apartment market. ​Check out more Austin Multifamily Market Research.